2000: OLTL's Nora interrupted Bo and Lindsay's wedding. 1969: On Dark Shadows, Ned Stuart (Roger Davis, in his second role on the show) showed up at Collinwood looking for Chris. He found Barnabas (Jonathan Frid) and Julia (Grayson Hall) at Chris's cottage, and told them that Chris was engaged to his sister implying that she was now dead. 1972: On Another World, Mary (Virginia Dwyer) believed Paula (Beverley Owen) wasn't right for Russ since she was more interested in her work than anything else, but Jim (Hugh Marlowe) and Alice (Jacqueline Courtney) felt it was up to Russ (Robert Hover) to decide. 1976: The film Taxi Driver was released, during which Travis Bickle (Robert De Niro) would knock over his television set while watching a scene between Jill Foster (Brenda Dickson) and Brock Reynolds (Beau Kazer) on The Young and the Restless. 1980: On The Edge of Night, Miles (Joel Crothers) attacked Derek (Dennis Parker). 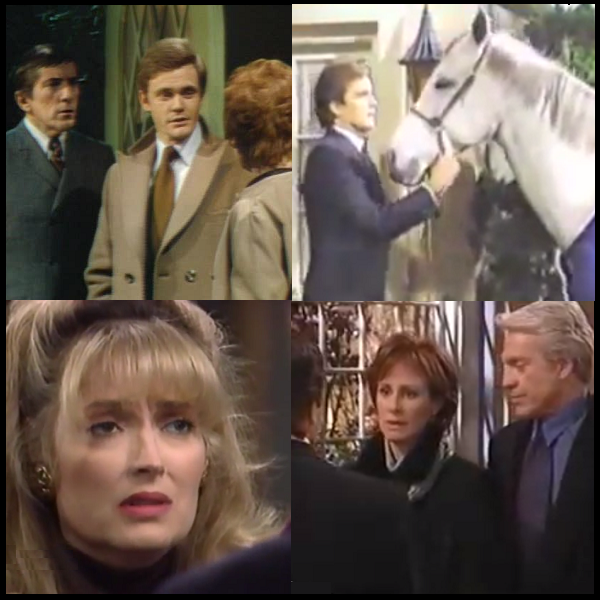 1986: On Santa Barbara, Mason (Lane Davies) gave Mary (Harley Kozak) a horse on her birthday. 1993: Actress Joy Garrett died at age 47. She was known by soap fans for her roles as Jo Johnson in Days of our Lives and Boobsie Caswell Austin in The Young and the Restless. 1993: On Genreal Hospital, Sean (John Reilly) told Tiffany (Sharon Wyatt) she might lose him if she continued to not play fair in her effort to get custody of Lucas. 1994: Actor Sorrell Booke, best known for playing Boss Hogg on The Dukes of Hazard, died at age 64. Before Dukes of Hazard, he played District Attorney Ira Newton in The Guiding Light. 1994: Jennifer Gareis represented New York in the Miss USA pageant, finishing in the top six. She currently plays Donna Logan on The Bold and the Beautiful. 2000: On One Life to Live, Nora (Hillary B. Smith) interrupted Bo (Robert S. Woods) and Lindsay's (Catherine Hickland) wedding. Said Nora: "She changed your results on the fertility test, making you think you couldn't father a child. She changed the results, Bo. You are about to marry the woman who changed all our lives." 2005: Former Emmerdale and Coronation Street star Stan Richards died at age 74. 2007: On All My Children, Jamie (Justin Bruening) asked for Maggie's (Elizabeth Hendrickson) help with Bianca. 2008: On Guiding Light, Natalia (Jessica Leccia) admitted to Gus (Ricky Paull Goldin) that she locked Olivia (Crystal Chappell) in the bathroom at the Bauer cabin to keep her from ruining their wedding day. 2012: One-time As the World Turns musical guest star Whitney Houston died at age 48.